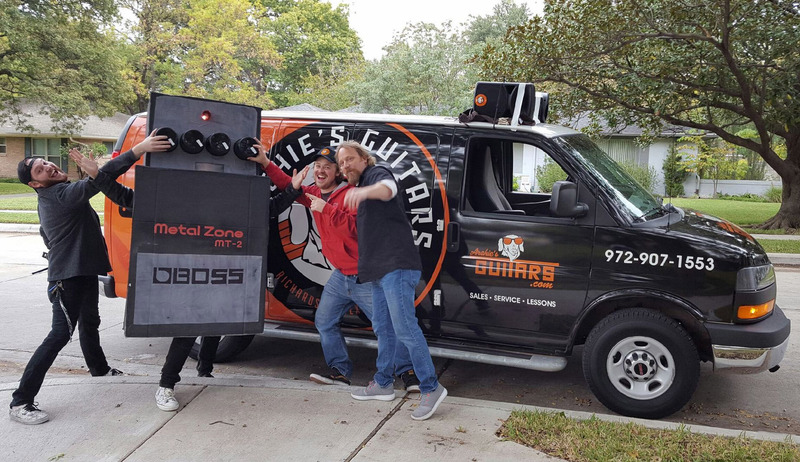 The team at Archie’s Guitars cuts up in front of the shop’s van. Jason Underwood (right) is the owner of the store and a longtime Heights resident. Editor’s note: The following is part of our series featuring local businesses. We believe everyone has a story to tell. If you know a business or neighbor who should be featured, email contact@heightspark.com. Admit it: you’ve played air guitar in front of a mirror at least once in your life. Probably way more than once. Well, you are in good company. For those of us who have considered taking our rock star dreams to the next level, Archie’s Guitars in the Richardson Heights Shopping Center is here to help. Jason Underwood, a longtime Heights resident and passionate musician, opened the all-things-guitar store about two years ago. Named for the Underwood’s family dog, Archie’s is a welcoming, family friendly shop that emphasizes customer service. Jason recently took time away from stringing guitars and sifting through spreadsheets to answer some questions about the Heights neighborhood and the store. You’ve lived in the Richardson Heights area for quite a while, right? What do you love about this part of the city? I grew up in this area — specifically a Brentfield Elementary/Parkhill Junior High/Pearce High School kid. When my wife, Claudine, and I moved into to the Heights neighborhood in 2003, we were drawn to the older homes, large lots and trees. More than that, we immediately clicked with all the folks in the neighborhood. We moved in as the “young” couple as many of the neighbors were original builders from the ‘50s and ‘60s. Since then, our daughter, who graduated from Richardson High School, is now a sophomore at the University of Colorado Boulder, and our son is currently a sophomore at RHS. Now we are the “old” folks! When did you start playing guitar (other instruments)? What do you love about playing music? I started playing guitar around fourth grade. I was completely hooked on music from as early as I can remember. The first album I bought was in first grade — a 45 of David Bowie’s “Fame.” Music listening and album buying haven’t slowed down 45 years later. When you were growing up, where did you get your gear? Was there a store like Archie’s that inspired you to open your shop? I started taking my first guitar lessons around 1979 at a local independent shop called the Music Haus, which as it happens was located across the street from where Archie’s is now. I really loved that “local” shop feel even then. I also spent many days riding my bike up to Prestonwood Mall and going to the Melody Shop. I meet lots of folks my age now that come into Archie’s with their own Melody Shop stories. It was a great chain. But as the ‘90s hit, many of the great independent shops as well as the Melody Shops of our area all went away. It was an ambition of mine starting around that time to open an independent music/guitar shop like the ones I enjoyed so much. What sets Archie’s apart from the competition? Archie’s was put together on the emphasis of customer service first. That goes back to the early ambition I had to one day open a local, independent shop like those I loved so much from the ‘70s and ‘80s that are now mostly gone in our area. At Archie’s I’ve brought in a select group of guys who not only have the right experience but the right attitude that seems to be lacking these days especially in “those” guitar shops. Not only in terms of sales but that attitude also carries over to our service and lessons. Our repair technicians have a great reputation and treat each guitar regardless of value as if it is their own. What recommendations do you have for someone who is interested in learning an instrument — guitar, bass, ukulele, etc.? Take a chance and try! Don’t be intimidated if you’ve never even picked one up before — you will be surprised at how much you can pick up with the right teacher. At Archie’s, we have a select group of instructors who I brought in not just because they are great players, but because they are great teachers and communicators. They all do a great job of identifying the individual student’s likes and leanings and build a plan from there — not just a one-method approach. We offer lessons for guitar, bass, ukulele, keyboards and even banjo. What are the three most-popular items you sell? In terms of volume, we move a lot of brand new Yamaha acoustic guitars at $199.99, Blackstar starter amps at $99.99 and Jackson electric guitars starting at $149.99. In terms of popularity, our line of Chase Bliss pedals are true high-end effects pedals, along with EVH (Eddie Van Halen) Wolfgang guitars and Orange Amplifiers are sought-after items. In addition to teaching lessons, making repairs, and selling gear, y’all occasionally host concerts, right? Now that the weather is warmer, we will continue to feature live acoustic music in front of the store, usually on Saturdays. We are planning our big two-year anniversary blowout for the end of the summer as well. What else should people know about Archie’s? More than anything, Archie’s is about the experience and the relationship with anyone that comes in. We operate Archie’s to be not only a shop for you to stop in and pick up a guitar and try out new gear but also to be able to be on a first-name basis with any and all of the guys here — a place you can trust no matter what level of player you are or want to be. 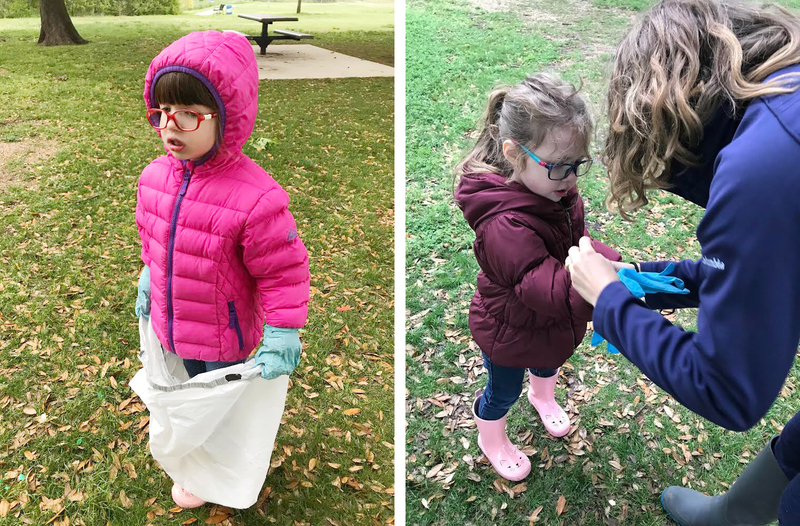 Warm clothes and boots were invaluable at the cold, wet Trash Bash on April 7 at Heights Park. An empty bottle in the grass. A sandwich wrapper near — but not inside — a trashcan. We’ve all seen these “Don’t Mess With Texas” fails. Last weekend, Huibrie Pretorius led a group of hardy Heights Park residents in cleaning up garbage at our neighborhood park. Huibrie, a native South African who moved to Richardson with her husband and two sons about two and a half years ago, teaches Tinkergarten, a learning-through-play class for young children at Heights Park. Cleaning up is part of her routine. “I have classes once or twice a week in the park. I do my best to clean up trash from the areas we’ll play in that day,” she said. Huibrie sought to make a bigger impact on the park’s appearance during Richardson’s annual Trash Bash. She created an event on the Heights Park Neighborhood Facebook group, and residents quickly responded that they’d attend. On the morning of the cleanup, temperatures dipped into the 30s, and lingering rain made for less-than-ideal conditions. However, five families including children ages 2 to 7 braved the weather to fill six bags with trash. Volunteers picked up many remnants from the previous weekend’s Easter celebrations — egg shells, confetti and even some treasure. Huibrie said she would consider organizing another cleanup event, perhaps another Saturday in the fall. She said she is pleased with neighbors’ enthusiasm and participation. 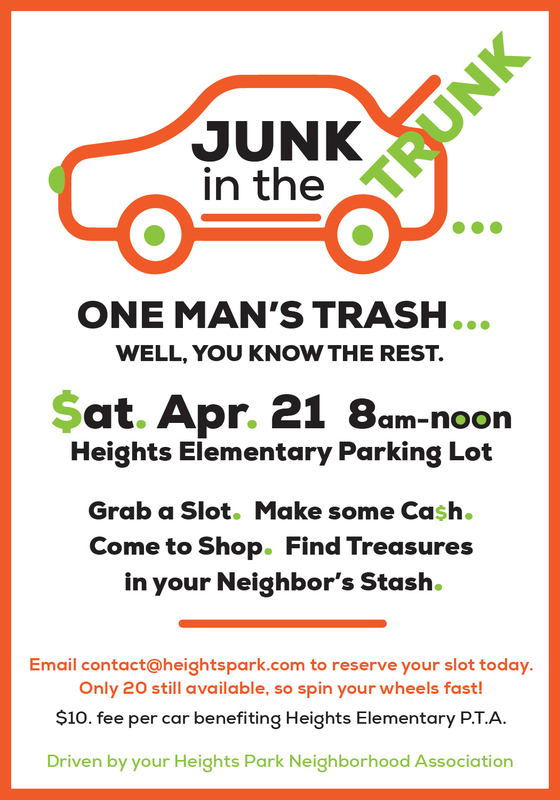 Heights Park Neighborhood Association is steering a fun spring sale — Junk in the Trunk. The first-time event will be from 8 a.m. to noon on Saturday, April 21, in the Heights Elementary parking lot.